..since I'm still working on my magazine projects, that I can't share here, and not much else is going on! How to enter: GIVEAWAY IS NOW CLOSED. Giveaway ends at 5pm Sunday, March 11th. Winners will be announced by 9 am Monday, March 12th. 1st entry = Leave a comment about what's keeping you busy these days. 2nd entry = Be a follower of the blog and leave a comment saying so. 3rd entry = Tweet about the giveaway and leave a comment saying you did. All entries are optional, and I will pick 3 winners. 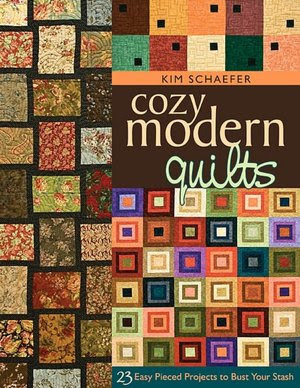 Winner #1 will win the first book listed, Cozy Modern Quilts. 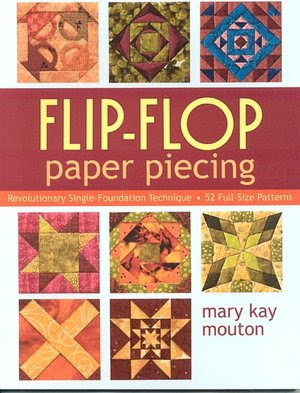 Winner #2 will win book 2, Flip Flop Paper Piecing. Winner #3 will win Sweetwater's Simple Home. To keep this fun for all, you can enter up to 3 times, but only win one book. If your number is drawn twice, I will draw another one to give someone else a chance to win a book. Quilt guild stuff is keeping me insanely busy! The only sewing I've done this week is from the workshop I took on Sunday and I don't know that that project will ever be finished. Will be so glad to get home tonight and set my sewing room back up. I'm getting ready to be out of town and away from my sewing machine for a couple of weeks so I'm sewing like crazy to try & get my fill before I go...started piecing a new project and machine quilting a top. Trying to get some hand work prepared before I go. I'm a follower through Google Reader & Itunes. What's keeping me busy - I'm working on a pin cushion for our guild swap and remodeling my sewing space. I am working diligently on a BOM that I happened to get behind on - I'm almost there! I've been a follower of your blog for quilte some time. Thanks for the giveaway. I'm just trying to get the house back into shape after a nasty bout with the stomach flu at our house. I am a friend follower and I tweeted the giveaway even though it means less chance for me to win. Absolutely nothing is keeping me busy right now. I'm flat on my back with a bulging disc. 5 weeks and counting, going stir crazy! I am a follower of your blog, so I guess that is what is keeping me busy, see above post. I'm reading lots of blogs. :) Always enjoy yours, Tanesha! I hope your magazine projects are going well - looking forward to a time you can reveal them. I am busy making a baby quilt for my soon to be niece/nephew and knitting a little baby cardigan (my first!) Thanks for the giveaway and thank you for the list of books you often give I have been looking at many of them - I am planning to give some to my mum for Mothers day which is very soon over here in the UK. Happy quilting. I am busy driving my daughter to driver's ed every day and trying to keep up with deadlines for work and other commitments. I follow the blog through google reader. I am a blog follower, thanks. Today will see me stitching the binding down on St Patrick's Day placemats for my Grand kids. I wish that I could say that my sewing and knitting were keeping me busy, but I've spent most of this week driving my kids around to their events. I did manage to finish a sock but it was very slow going. I also follow the blog, don't do twitter yet. My in laws have been staying with us for the last 8 weeks so that's been keeping me busy! They are not much trouble, but I cannot wait to have the house back to just me and my husband and my sewing machine... Thnaks for the giveaway Tanesha! I am a blog follower and have been for awhile. Just tweeted about the giveaway. These books look great! Besides toddler chasing - I've been busy working on some hexagon hand piecing and some citrus preserving. I am actually keeping busy this week finishing quilts! Today we finished the one for my side of the bed, and I sewed the borders on hubgbie's quilt for his side of the bed, and I pieced his backing. Tomorrow I hope to finish the second quilt - very exciting! I follow your blog (and love it, I might add)! What's keeping me busy? Planning a Disney Spring Break trip with my family! I have a purse in the works to carry during the trip. A co-worker is having a baby and I have a small stuffed bear to finish for them. Random stuff, apparently! I was busy in the last week travelling up to Edmonton (Alberta) for my Mom's 80th birthday. It was a lot of fun, and it's nice to see her so healthy at her age. Follower. ! Thanks tanesha. ! Work and trying to finish UFO'S!!! The only problem is I seem to keep starting more projects! I am getting better at finishing or frogging than I used to so that is helping. I knit mostly but do need to get the sewing/quilting mojo back...maybe this summer. I am busy quilting a jelly roll race top made from a Moda Christmas jelly roll. I'm already a follower of your blog & love your podcast. Keeping me busy making quilt blocks using bento box pattern from batiks, doing the monthly Craftsy block of the month with Amy Gibson, I have quilted for a while but really enjoy her easy new to me techniques. I'm currently working on my Swoon quilt and just screwed up the size blocks I was using for my half square triangles...grrr! What keeps me busy? Right now I am working on 3 very different quilts...one is hand piecing, one is applique and one is machine pieced. Just finished painting the kitchen/dining room. And beleive it or not, mowed the yard for the first time this year. I could do with less mowing and more quilting. Love your podcast. My first queen-sized quilt is keeping me busy. I can't believe how BIG it is! Also, potty training will be keeping me busy this week. I took the week off from work to focus my efforts and het 'er done. Wish me luck! I spent last night working on a wallhanging for April, finished March a week ago and just need to find a place to hang. Also working on a tablerunner, but have run into a block that I just don't quite understand the directions and haven't taken the time to figure it out. Unfortunately my other job is keeping me busy! FINALLY found one of my favorite podcasters on her new pod cast channel or whatever it is called. HAD to find that pattern Swoon and working on one for Quilts Of Valor. I will sign up to be a follower as soon as I send in this comment. I do not Tweet for fear of having NO TIME to sew if I ever got on there. Had lots of laughs hearing about the ballet expenses. Brought back some lovely memories. I am prolly the age of your Mom.